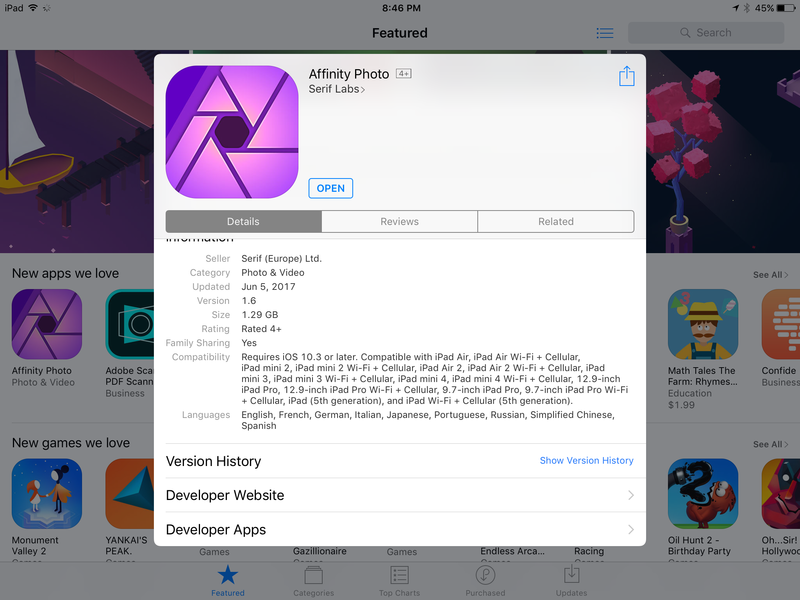 We’re sorry that you’re unable to use Affinity Photo on your iPad. Affinity Photo for iPad requires at least a 9.7 inch screen and uses specific Metal features that are only available to the iPad Air 2, iPad 2017 and all iPad Pro sizes. Due to the way the App Store works, it wasn’t possible for us to exclude all of the unsupported models of iPad. Because of this we added this phrase into the description on the App store page "supports iPad Pro, iPad Air 2 and iPad (early 2017). Please note that older iPads are not supported", hoping that users would see this before purchase. We are requesting a change to the App Store submission process to avoid unsupported models from being listed. If you’ve purchased the app and you have an unsupported iPad, please contact Apple to get a refund. Is it possible to make that phrase show in bold on the app store page like it is in your post? As it is, it is easy to miss in the description.